Statistics have long shown that the majority of passenger vehicle and semi truck crashes are caused by motorists and Nevada is the latest of many states taking a more hands on approach to curbing the increasingly fatal problem. 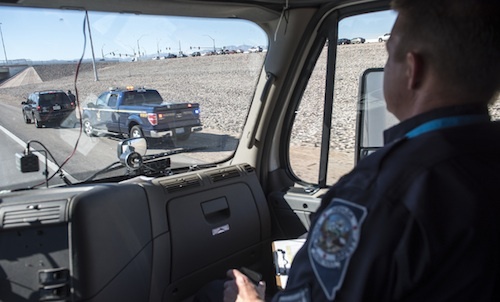 This week Nevada Highway Patrol’s “Badge on Board” crackdown has troopers riding in unmarked semis to catch dangerous motorists in the act. Once they spot an illegal move from their perch in the semi, they contact officers in marked patrol vehicles to stop and issue citations. According to NHP, passenger vehicle drivers cause or contribute to 81 percent of the roadway fatalities involving trucks while truckers cause or contribute to 26 percent of the fatalities. The Nevada Department of Public Safety says it’s also becoming a worse problem and in 2016, the fatalities in such accidents increased. “Our goal is not writing tickets, it’s keeping everyone safe on our roadways. 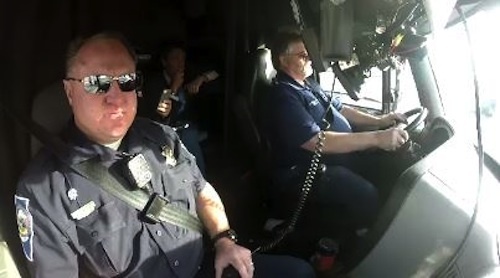 Failing to yield, unsafe lane changes, speeding and driving in a truck driver’s blind spot is not just illegal, it can kill you,” explains Lieutenant Roy Baughman. Sergeant Murwin has been patrolling the roads for over 16 years and says his biggest issue is with motorists pulling right in front of trucks as they're coming up to an exit. He says he sees this happen all too often and that many motorists don’t realize that trucks are 80,000-pound monsters requiring a lot of space to stop. According to one veteran truck driver, a safe stop requires 100 feet even at 30 mph and 500 ft. for a fully loaded semi going 65 mph. "They figure they can beat the big rig. They're smaller, faster. But if something happens, that truck's not stopping. They're just not thinking about the truck, and what the truck driver is controlling." "Badge on Board" officers will also be using the campaign to hand out fliers educating motorists on how to share the road safely with semis.